This study was designed to evaluate academic supervision program at PAUD Tunas Kasih, Magelang, using Context, Input, Process, Product (CIPP) evaluation model. The results of the study were expected to provide inputs to decision-makers for subsequent programs. The respondents of this descriptive-qualitative research included the school principal, six teachers, and a school managerial staff. Data collection was done through interviews, observation and document studies. Triangulation of data sources and methods validated the data, subsequently analysed through data condensation, data display, conclusion drawing and verification. Findings indicated the context evaluation revealed a need for academic supervision based on the condition and the need for teacher’s quality improvement. The input evaluation described the well-planned program—using different techniques, involving the teachers in their readiness, supported by available budget and infrastructure. The process evaluation reported the implementation of the planned techniques, with some adjustments based on the on-going condition, supported by the teachers’ readiness as well as participation and how they handle the constraints. The product evaluation found out that the academic supervision program had positive impacts and achieved the planned goals. It also discovered teachers’ positive responses and some follow-up plans. Lastly, this study gave recommendations to improve the local supervision programs, inputs to the school management, and ideas for future researches. Aaronson, D., Barrow, L., & Sander, W. 2007. Teachers and student achievement in the Chicago public high schools. Journal of Labor Economics, 25, 95–135. Alatas, H. 2013. Early childhood education and development services in Indonesia. Dalam Suryadarma, D., & Jones, G. W. (Eds.). Education in Indonesia. Singapore: Institute of Southeast Asian Studies. Arikunto, S. 2012. Dasar-Dasar Evaluasi Pendidikan, Edisi Kedua. Jakarta: Bumi Aksara. Arikunto, S., & Jabar, C. S. A. 2010. 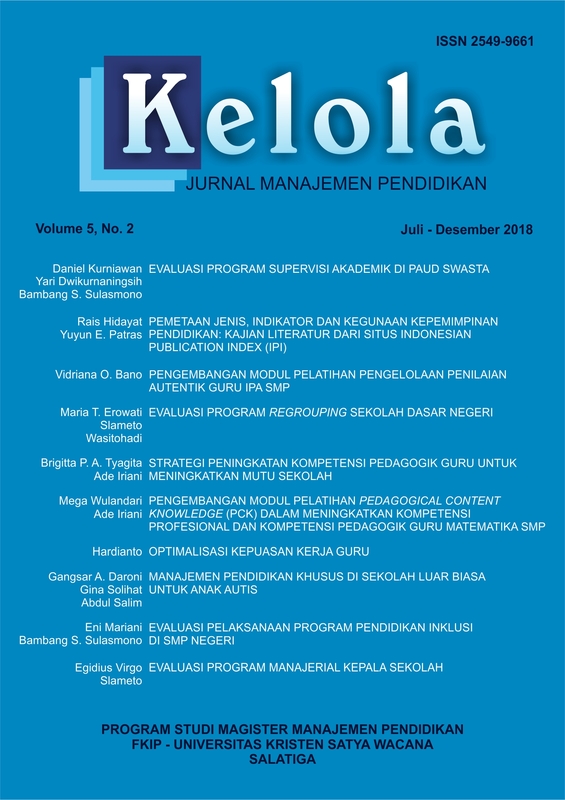 Evaluasi Program Pendidikan: Pedoman Teoritis Praktis bagi Mahasiswa dan Praktisi Pendidikan. Jakarta: Bumi Aksara. Arikunto, S., & Yuliana, L. 2012. Manajemen Pendidikan. Yogyakarta: Aditya Media. Brown, G. B. 2002. Guiding faculty to excellence: Instructional supervision in the Christian school. Purposeful Design Publications. Dwikurnaningsih, Yari. 2017. Evaluasi Program Kelas Olahraga di SMP Negeri 3 Salatiga. Repository Perpustakaan Universitas. Salatiga: Magister Manajemen Pendidikan UKSW. Egwu, S. O. 2015. Principals' Performance in Supervision of Classroom Instruction in Ebonyi State Secondary Schools. Journal of Education and Practice, 6(15), 99-105. Fitzpatrick, J. L., Sanders, J. R., & Worthen, B. R. 2012. Program Evaluation: Alternative approaches and practical guidelines, 4th ed.. New Jearsey: Pearson Education. Garrett, R., & Steinberg, M. P. 2015. Examining teacher effectiveness using classroom observation scores: Evidence from the randomization of teachers to students. Educational Evaluation and Policy Analysis, 37(2), 224-242. Kartono, S. 2009. Sekolah bukan pasar: catatan otokritik seorang guru. Jakarta: Penerbit Buku Kompas. Lukum, A. 2013. Evaluation of science learning supervision on secondary schools. International Journal of Education, 5(4), 61-81. Mawarni, R., Chiar, H. M., & Sukmawati, H. 2017. Supervisi Akademik di Sekolah Menengah Atas Negeri 1 Pemangkat Kabupaten Sambas. Jurnal Pendidikan dan Pembelajaran, 6(1). McMillan, J. H. 2008. Educational Research: Fundamentals for the customer, 5th Ed. Pearson. Memduhoglu, H. B. 2012. The issue of education supervision in Turkey in the views of teachers, administrators, supervisors, and lecturers. Educational Sciences; Theory and Practice, 12(1), 149-156. Mette, I. M., Range, B. G., Anderson, J., Hvidston, D. J., & Nieuwenhuizen, L. 2015. Teachers' Perceptions of Teacher Supervision and Evaluation: A Reflection of School Improvement Practices in the Age of Reform. Education Leadership Review, 16(1), 16-30. Miles, M. B., Huberman, A. M., & Saldana, J. 2014. Qualitative Data Analysis: A methods sourcebook, 3rd Ed. Sage. Minarti, S. 2011. Manajemen Sekolah: Mengelola Lembaga Pendidikan Secara Mandiri. Yogyakarta: Ar-Ruzz Media. Moswela, B., & Mphale, L. M. 2015. Barriers to clinical supervision practices in Botswana schools. Journal of Education and Training Studies, 3(6), 61-70. Moye, M.J., Henkin, A.B., & Egley, R.J., 2005. Teacher‐principal relationships: Exploring linkages between empowerment and interpersonal trust. Journal of Educational Administration, 43(3), 260-277, https://doi.org/10.1108/09578230510594796. Mukhtar & Iskandar. 2009. Orientasi Baru Supervisi Pendidikan. Jakarta: GP Press. Mulyasa, E. 2012. Manajemen dan kepemimpinan kepala sekolah. Jakarta: Bumi Aksara. Munthe, A. P. 2015. Pentingnya Evaluasi Program di Institusi Pendidikan: Sebuah Pengantar, Pengertian, Tujuan dan Manfaat. Scholaria: Jurnal Pendidikan Dan Kebudayaan, 5(2), 1-14. Pidarta, M. 2009. Supervisi Pendidikan Kontekstual. Jakarta: Rineka Cipta. Priansa, D.J., & Setiana, S.S. 2018. Manajemen dan Supervisi Pendidikan. Bandung: Pustaka Setia. Range, B.G., Young, S., & Hvidston, D. 2013. Teacher perceptions about observation conferences: what do teachers think about their formative supervision in one US school district? School Leadership & Management, 33 (1), 61-77. Riyanto. 2016. Evaluasi Program Supervisi Akademik Kepala Sekolah dapat Meningkatkan Kinerja Mengajar Guru SD Negeri 1 Tegorejo, Kecamatan Pengandon, Kabupaten Kendal. (Tesis, tidak diterbitkan). Program Pascasarjana, Universitas Kristen Satya Wacana, Salatiga. Rockoff, J. E. 2004. The impact of individual teachers on student achievement: Evidence from panel data. American Economic Review, 94, 247–252. Sagala, S. 2010. Supervisi Pembelajaran dalam Profesi Pendidikan. Bandung: Alfabeta. Saputra, Y. M. 2011. Model Pengawasan Pembelajaran Pendidikan Jasmani di SD. Cakrawala Pendidikan, (3), 474-489. Sarfo, F. K., & Cudjoe, B. 2016. Supervisors’ Knowledge and Use of Clinical Supervision to Promote Teacher Performance in basic schools. International Journal of Education and Research, 4(1). Stronge, J. H., Richard, H. B., & Catano, N. 2013. Kualitas Kepala Sekolah yang Efektif. Jakarta: PT Indeks. Suhardan, D. 2010. Supervisi Profesional: layanan dalam meningkatkan mutu pembelajaran di era otonomi daerah. Bandung: Alfabeta. Sukardi, H. M. 2008. Evaluasi Pendidikan Prinsip dan Operasionalnya. Jakarta: Bumi Aksara. Suryadarma, D., & Jones, G.W. 2013. Meeting the education challenge. Dalam Suryadarma, D., & Jones, G. W. (Eds.). Education in Indonesia. Singapore: Institute of Southeast Asian Studies. Tatang, S. 2016. Supervisi Pendidikan. Bandung: Pustaka Setia. Umiarso & Gojali, I. 2010. Manajemen Mutu Sekolah di Era Otonomi Pendidikan. Yogyakarta: IRCiSoD. Wanzare, Z. 2012. Instructional supervision in public secondary schools in Kenya. Educational Management Administration & Leadership, 40(2), 188-216. Widodo, T. 2014a. Evaluasi Program Implementasi Supervisi Akademik di Gugus Dwijawiyata, Kecamatan Magelang Tengah, Kota Magelang. (Tesis, tidak diterbitkan). Program Pascasarjana, Universitas Kristen Satya Wacana, Salatiga. Widodo, T. 2014b. Supervisi Kunjungan Kelas dalam Meningkatkan Kinerja Guru IPA SMP Negeri 1 Bandungan. (Tesis, tidak diterbitkan). Program Pascasarjana, Universitas Kristen Satya Wacana, Salatiga. Wiersma, W., & Jurs, S. G. 2005. Research Methods in Education: An introduction, 9th ed. Pearson Education. Zepeda, S.J. 2006. High stakes supervision: we must do more. International Journal of Leadership in Education: Theory and Practice, 9:1, 61-73, DOI: 10.1080/13603120500448154.